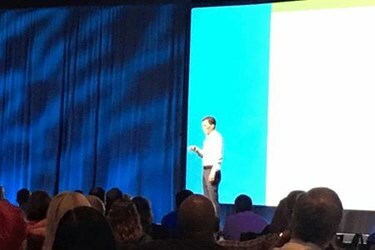 What does CompTIA CEO and president Todd Thibodeaux think needs to happen to make sure the future of the industry remains bright? Hint —you may not be able to get a certain Whitney Houston song out of your head when you find out. CompTIA president and CEO Todd Thibodeaux kicked off day two of CompTIA ChannelCon 2016 with a stirring keynote speech centering on the future of the industry — a future tied directly to our ability to attract the best and brightest minds of the next generation. So how do we attract the best and brightest; how do we communicate to a new generation there are great opportunities waiting for them? The first step for CompTIA was to find the right partner, and that partner turned out to be IDEO, a global design firm that takes a human-centered, design-based approach to helping organizations in the public and private sectors innovate and grow. IDEO assembled a team tasked with solving the problem of how the industry can encourage students ages 14 to 18 to pursue a career in IT. The team found students progress through the career process in two phases: aspirational and reality. In the aspirational phase, they are dreamers, not in a career mindset. The future is completely open to them, as are the realities of what the future holds. The next phase is the reactive phase in which students who have to make decisions and the realities of life — finances, grades, and motivation — set in. IDEO also found once the reactive phase is reached, the college dream is all powerful. This is a powerful reality, but it also creates a problem in that high school becomes preparation for college and as a result, curriculum is being built that excludes and/or minimizes tech programs. Compounding that problem is there is no silver bullet that will fix this and persuade students to consider a career in IT. And this is where the industry can help itself: bring passionate people who can interact with the students we need to grow and thrive in the future. Thibodeaux turned the program over to Charles Eaton who leads the charitable arm of CompTIA, the Creating IT Futures Foundation, which enables people to improve their lives through employment in the IT industry. The foundation's services help at-risk individuals and populations under-represented in IT prepare for, secure, and be successful in IT careers. Eaton said CompTIA is “building on what we learned from our time with IDEO by creating NEXTUP, a four-year plan to prototype, make changes, question our own assumptions.” NEXTUP will work to create and implement in-school and out-of-school curriculum and projects that provide role modeling and mentoring opportunities. “This has to be a long-term engagement where there is ample opportunity to spend time with the kids,” Eaton added.